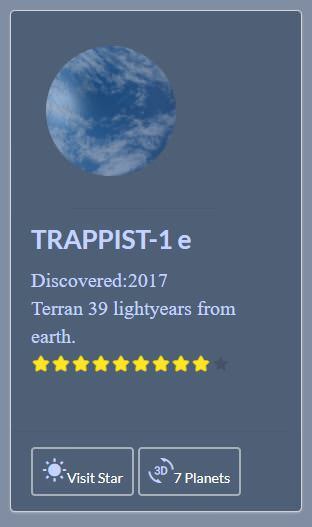 Catalog a section where you can browse all confirmed Exoplanets. It is possible to filter for just habitable planets or search for a specific planet name. You can visit information pages about the planet and the star. The information is autogenerated from the database, hower more information about some planets could be found on this blog and more will come in the future. By clicking on the 3d button you can see an simulation of the solar system. Map in this section we have a star map of all the 88 modern constellations. And all habitable planets are shown as markers in the map. If you click on the planet marker you will visit the 3d solar system and clicking on a planet takes you back to the information page. It also possible to visit a page that lists all stars in a constellation by clicking on the name of the constellation in the map. The information about right ascension, declination and sidereal time is displayed in the navbar. What that means is explained in this blog post: How do we locate stars. The location of the user is requested so we will be able to calculate the sidereal time. If you wanna locate exoplanets position we recommend the android app as the device has sensors for it. Chart this is a completely new feature just for the web. A Hertzsprung-Russell diagram the bubble chart is a plot of luminosity against the temperature of the star for all stars that have exoplanets. It reveals the spectral class of the stars and where the star is placed in the main sequence of stars. More information about that in this blog post: How to Classify Stars. Clicking on a bubble will take you to the solar system of the star.